Sandhill Crane Day: Students travel to Jasper-Pulaski Fish and Wildlife Area to learn about the Sandhill Crane. They learn about their bones, difficulties cranes encounter while migrating, a compass migration challenge, and they observe the cranes from the tower while learning information about the birds. Garbage Pizza: Students discover what items are in their landfill. Circle graphs depict the percentage of the types of items in a landfill. Students then create a giant circle graph made from cookie dough and divide it into the eight different categories. They use their percentages and place different colored M&M’s in each of those categories. When finished, they enjoy eating their garbage pizza! Water Riches: Students learn about water, our most precious natural resource. There are five lessons with hands-on experiments for the students to enjoy learning about. 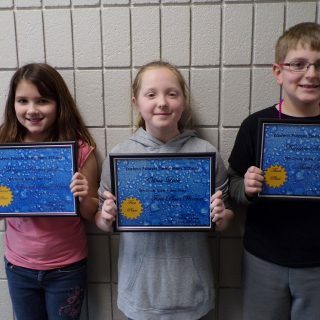 Students write an essay about what they have learned and then prizes and certificates are awarded. Cookies and punch are enjoyed afterward! Field Day: Students learn about micro invertebrates, the history of the fire tower, water sheds, and prey/predator relationships. 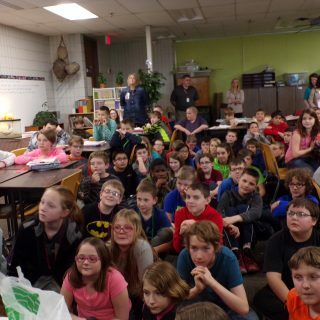 Earth Day: Pulaski County SWCD partners with the fifth grade to present an earth day program to kindergarten – fourth grades.